extraordinarily healthy diet well beyond what most people do for themselves, perhaps eating super foods and/or supplements by the truckload and YET have fatigue, low appetite, weight gain, bloating, gas, constipation, food sensitivities and low vitality? Why is that? Well, one likely reason is Low Stomach Acid. micro-organisms can easily invade, acid acts as a chemical barrier preventing unfriendly bacteria/viruses/parasites frequently found in animal products (especially raw fish) as well as unwashed vegetables (i.e. spinach) from colonizing inside you. Your stomach acid, which is part of your immune defence, is meant to have a pH of 2; enough acidity to destroy these micro-organisms. Stomach acid also has a digestive purpose in chemically breaking down food particles in order for your small intestine to absorb the nutrients. In modern people, stomach acid is often weak and gets even weaker as we age due to long-standing poor dietary habits. Ever wonder why many elderly people have poor appetites and eat bird-size meals? My grandfather who lived to be 98 and took apple cider vinegar (which increases gastric acid secretions) regularly had the strongest appetite of anyone I know. He would take us to a Chinese buffet and have four full plates of every kind of food plus two full dessert plates. 1. Protein in food is not broken down. Protein in it’s broken down state is amino acids (protein molecules). Amino acids are the basis of neurotransmitters (naturally chemicals used by the brain and nervous system to relay information between the brain and various areas of the body). Without enough neurotransmitters, the nervous system doesn’t do it’s job leading to things like mood disorders such as depression. Poor protein digestion also causes hair loss and brittle nails (nails and hair are made of protein). Another issue with poorly digested protein is that it often sits too long in the intestines causing bacterial growth and weakening of the intestinal walls. This is called ‘leaky gut syndrome” meaning food matter leaks out the walls of the intestines. This leakage causes an immune response because the food matter isn’t where it’s supposed to be, the peritoneal cavity. Anti-bodies are made in response to the food particles in the peritoneal cavity which then sets off an immune response every time you eat foods that you have antibodies to. The more the low stomach acid situation continues, the more food sensitivities, inflammation and auto-immune diseases develop. 2. Bacteria and other unwanted micro-organisms get a foot-hold in the digestive tract (think H. pylori, the bacteria known to be responsible for stomach ulcers, as well as parasites). 3. Although this sounds contradictory, low stomach acid is actually one of the causes of acid reflux, heartburn and G.E.R.D. (Gastro-Esophageal Reflux Disease). How so? With each of these conditions, contents from the stomach are backing up into the esophagus because the lower esophageal sphincter (LES) is not closing tight enough. Why is the LES not closing? The is because the stomach acid is not sufficient to break down the food or destroy bacteria causing the pressure in the stomach to build up. 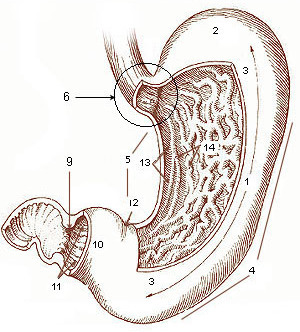 The fermentation of stagnant food means the lower esophageal sphincter must open to release the pressure. 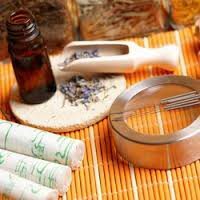 Initially, the treatment is to calm the acid reflux with chamomile and slippery elm to heal the irritated esophagus. Antacids, baking soda or milk will comfort the esophagus in the short term but since these products are intensely alkaline they will actually weaken stomach acid. Once the acid reflux has calmed down, the next step is the increase stomach acid using bitters. 4. Low stomach acid means poor absorption of nutrients, especially minerals such as non-heme iron sources (plants), B12 and folic acid. 5. As the food is not properly broken down by stomach acid, it putrifies (rots) in the gut causing gas, bloating, belching and constipation. How to tell if your stomach acid is low? One simple way which you can do at home is called the beet test. Eat a beet or two (salad, steamed, juiced, doesn’t really matter how). If your urine or bowel movements turn pinkish-reddish (called beeturia) within the next 24 hours , you will know that your stomach is not breaking down and assimilating the pigments which indicates that you are not getting enough nutrients from your food. Ok, now for the therapeutic answers. It’s interesting how TCM and Western herbal medicine both agree so well on this issue: bitters! Bitters are so important for your stomach and digestion and need to be eaten every day. Vinegar which is considered a bitter food in TCM, is a key ingredient used in the recipe below. There are hundreds of bitter foods. All those leafy green vegetables your mom wanted you to eat and you ate them because she promised you dessert. Most green leaves have a bitter quality. Some common bitters are dandelion, alfalfa, plantain, red clover, arugula, wheat grass, barley grass, parsley, watercress, and a whole lot more which you may even find growing in your yard (careful – don’t eat if sprayed with herbacides). Cabbage in TCM is slightly sweet and benefits the Spleen and Stomach systems. It also clears toxins from the bowels and improves circulation. Cabbage also contains vitamin U which heals the stomach lining and increases appetite. Fresh raw cabbage juice is an age-old remedy for gastric ulcers. The vinegar is a bitter which stimulates acid production in the stomach. The raw vegetables contain live enzymes which help digest the food. The Celtic sea salt contains chloride needed in the production of hydrochloric acid (A.K.A. stomach acid). **For those who have an active heartburn/acid reflux situation going on, wait until the the heartburn/acid reflux calms down (takes about 2-3 weeks to clear using chamomile, marshmallow root and slippery elm daily) before using the vinegar, onions and garlic as these foods can be heartburn triggers. Some people report that apple cider vinegar doesn’t trigger their heartburn while regular vinegar does. Also, dried garlic and dried onion powder can be used as substitutes as these are less triggering than the fresh kind. 1. 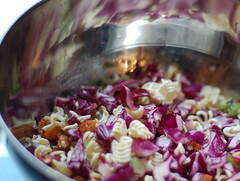 Shred cabbage and onion in a food processor or with a grater. 2. Add in apple cider vinegar, raw almond butter, garlic, honey. coriander, cumin and salt. 3. Mash ingredients together until fully mixed. I will try the cabbage salad recipe! Thanks for all the great tips.